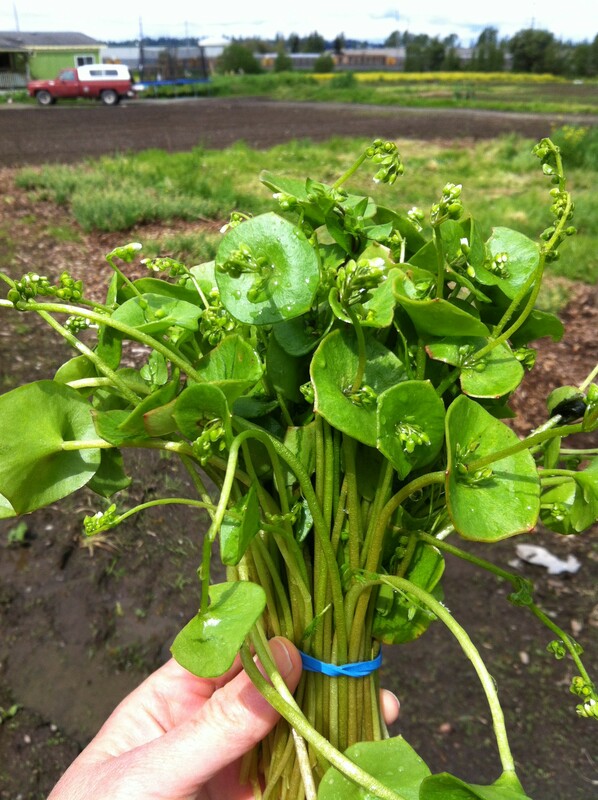 Claytonia perfoliata, or “Miners’ Lettuce” is a tasty spring green. We value it because it germinates and grows when the temperature is cold and wet, whether that is fall, winter or spring. Everyone has heard the expression, “tastes like chicken”. It’s applied to many unusual meats—Rattlesnake comes to mind, or even Rabbit. In the vegetable world, the expression goes, “tastes like spinach”. Any time I hear or read someone explaining Amaranth, Lambsquarter, Orach, New Zealand Spinach, or even Claytonia, they say it tastes like spinach, or “cook like spinach”. However, I’ve tasted all of these things and I don’t think any taste much like spinach. Amaranth is “gamey” to me, as much as a leaf can be gamey. Claytonia has other names, “Miners Lettuce” is a famous one, because technically it is a weed or “native plant” that miners ate to prevent scurvy, as it is high in vitamin C. It’s also called “Winter Purslane”—it actually IS in the Portulaca family, like tangy summer purslane, and it shares the fleshy, succulent leaves, but that’s about all. What it does provide is a tender, crunchy, juicy salad. And it’s pretty. Beautiful bunches of Spring Onions. Many people wonder about onions. Green onions, spring onions, scallions, salad onions. Around here, we generally only find Spring Onions in the spring—for us, they are the missed-over summer bulbing onions, Allium cepa, that overwinter and come back in multiples in the spring. For some magical reason, if we leave a bulb onion (like Walla Walla or Torpedo) in the ground over the winter, the bulb will rot away, but the “basal plate” where the roots emerge will sprout several new onions in the spring. We count on that freakish, survivalist behavior to provide our loyal customers with tasty Spring Onions. We deliberately plant Green Onions, also called a “bunching” onion or a “multiplier” onion, or a “Welsh Onion”, or Allium fistulosum, because one seed turns into a plant that will multiply into several distinct onion plants rather than forming a bulb. There are specific varieties for this purpose, and the family includes chives. Interestingly (and Mike, as an onion-hater doesn’t get this), on our application form when we ask for favorite vegetables, ONIONS in some form appear on 80%. So, we try to make sure we have some form of onion each week. It’s a trick, because we really do depend on those overwintered spring onions for April and May. 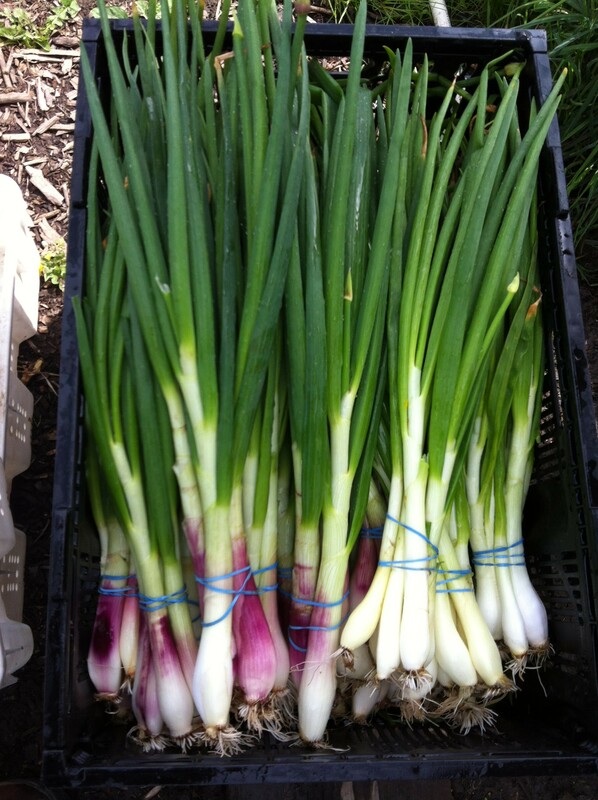 We plant yellow onion sets as early as possible to provide green onions for May and June, and possibly July. We start green onion seeds in the greenhouse to give us pretty, tender bunches of green onions throughout the summer. And we set out tens of thousands of onion transplants in May to provide those amazing Walla Walla and Torpedo onions from July-September, and Yellow Bulb onions for the fall. Today I planted an awful lot of Leeks, as well, which should get outside into the ground in June so that we have tasty leeks to get us through the winter. Leeks are the only freeze-hardy onion. Ah, the humble onion. Onions and garlic are the basis of almost every meal for my family. We sauté them as a start to soup or pasta sauce, pickle them for sandwiches, and chop them fine and raw for salads. This week we had a great dinner that brought out the best in our spring onions – Italian meatballs! In a food processor, chop the bread cubes until they become fine crumbs with some larger bits of bread left. The bread should be very stale and dry. Don’t use white sandwich bread; it will make your meatballs pasty. In a large mixing bowl, combine the meat, egg, bread, onions, garlic, and herbs. Crush the herbs a little as you add them to help release the flavor. Using your hands mix the ingredients until well blended. If the mixture seems a little dry, drizzle with olive oil. Take a small handful of the mixture and roll it into a walnut sized ball. Repeat with the remaining meat. Heat olive oil in a large skillet over medium heat. Add the meatballs and cook until browned on each side. Add a little water, cover, and reduce the heat to low to cook the meatballs through (10-15 minutes). We finished our meatballs in homemade marinara sauce and served over pasta. The dish was delicious and highlighted the flavor of the onions and garlic.